There seems to be much dissatisfaction about the size and the composition of the present Cabinet, but, it is time to accept the state of affairs and turn the spotlight on the performance of the Cabinet Ministers. 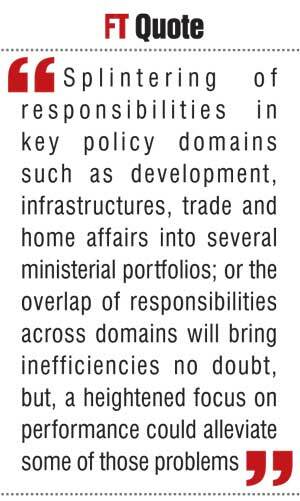 Splintering of responsibilities in key policy domains such as development, infrastructures, trade and home affairs into several ministerial portfolios; or the overlap of responsibilities across domains will bring inefficiencies no doubt, but, a heightened focus on performance could alleviate some of those problems. Verite Research has already taken up the challenge. Their recent work has uncovered a slush fund which has been maintained as a special allocation to the Treasury and used at the discretion of the Treasury secretary, the only condition being that the Parliament has to be informed within two months. During 2014, the slush fund had received Rs. 62 billion, an amount exceeding the total expended on irrigation and agriculture that year. This kind of information will lead to dialogue and debate in Parliament and outside leading to more accountable budgetary allocations in the future. More work needs to be done to go deeper and assess ministry by ministry and agency by agency regarding their performance, but, civil society need not be overly burdened with such work. Governments world over including our own have mechanisms for accountability. It is a matter of uncovering and activating those. A quick scan of practices across government shows that most governments share information about the efficiency of their services but not necessarily on the effectiveness of those services. Efficiency is when day-to-day to activities of governments such as regulating, licensing and the provision of services are carried out in a timely manner as proscribed. Effectiveness is achieving larger objectives that lead to better lives for individuals and families and a better society for all. The UK Government appears to focus on efficiency with detailed statistics made available on each and every agency in regard to the services they deliver, but, not on effectiveness or impact. The Singapore Government is silent as far as the internet presence of its performance data is concerned. Australia has been debating accountability issues for a while before passing an Act titled “Public governance, performance and accountability” in 2013 and enabling the accompanying “Australian Government Perfor mance Measurement and Reporting Framework.” Key performance indicators that inform government and the public about the impact and cost‐effectiveness of public entities are the fundamental underpinnings of this framework. The US Government perhaps has the more advanced and established government accountability system. The Government Accounting Office and the Office of Budget and Management together would cover efficiency and effectiveness issues, but, a web site dedicated to making available performance data in the public domain was initiated in 2009 by President Obama. The www.performance.gov web site allows government agencies to post their strategic goals and related indicators as well as key performance indicators for their programs. Following key performance indicator, one of many from Department of Education web page, is illustrative of the focus on measurability in this Obama initiative. When all government agencies plan their activities around measurable outcomes and make those plans and outcomes available freely in the public domain, congressional representatives are able to be accountable to the public in a more orderly and transparent manner. Of the four types of committees active in our Parliament, the consultative committees which are would correspond to each Ministry in the prevailing Cabinet are the most relevant here. In addition to advising the Parliament about issues pertaining to the subject matter of the ministry, these Committees are asked to review and approve annual reports submitted by the state institutions under the purview of the relevant ministry. Judging by the proceedings of these committees available on our Parliamentary web site, these annual reports do not seem to receive sufficient scrutiny. Not all annual reports are submitted in a timely manner either and it is not clear whether all institutions comply with the reporting requirements. In the Parliamentary tradition the question time gives the members of parliament the opportunity to ask questions from government ministers (including the prime minister) and the latter are obliged to answer. Here, the MP is essentially asking about key performance indicators regarding the efficiency of the institution. It is not clear whether the annual report of the SLTB has this information. If it does, the question time could have been used more productively to ask more penetrating questions about the data. If the annual report does not contain these basic performance measures, then there is a need to change the format of these reports. It is unfortunate that valuable information appears momentarily at consultative committee meetings or in the floor of the Parliament only to get buried inside printed documents gathering dust in libraries or buried inside PDF versions of Hansards or Consultative Committee Reports. There is an urgent need to bring reporting procedures in Government to the electronic age where key performance data and other indicators on inputs, processes, outputs and outcomes of government institutions are collected and displayed in comparable formats using the Internet as the medium. These new procedure should be institutionalised and mandated through the proposed right to Information Act. In fact enabling access to the performance data for Government institutions is the low-hanging fruit for a Government seeking to prove its sincerity in promoting right to information.